Looking for a great food WordPress theme? This is a collection of the best food WordPress themes. 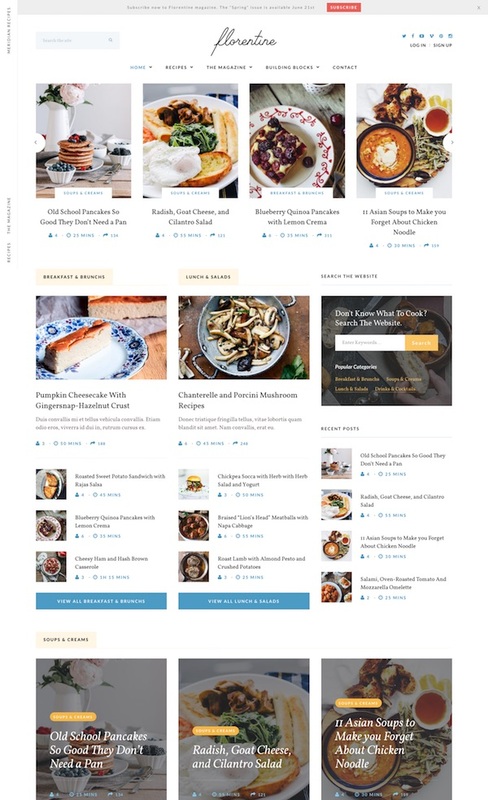 If you’re a food blogger, chef, food critic, foodie, or a food lover wanting to build a recipe and food blog, food magazine website, or restaurant review site, these beautiful food oriented WordPress themes are just what you’re looking for. Many of these themes include food and recipe specific features required in a food website such as inbuilt recipe and ingredients post templates, menu templates and recipe plugin support. They also have clean designs, picture galleries and space for large pictures / video in your posts to showcase your tasty food creations. Below is a collection of 20+ premium and free food WordPress themes that will inspire you to start a blog food today. Bon appétit! Cook’d is an appetizing food WordPress theme for the Genesis Framework. The premium child theme has a super clean, crisp and minimalist design that’s very easy on the eyes and ensures your food photos really stand out. The theme is perfect for foodies and food bloggers to build a website to share their food creations and culinary discovers for content hungry visitors. Some of the key features and benefits of the theme include: large hero section for featured images, widgetized homepage for a flexible layout, recipe index filter, flexible grid archive options, areas for ads and opt-ins, WooCommerce ready, styled sharing buttons, featured posts widget, easy newsletter subscription integration, theme customizer and more. Salt & Pepper is a food and recipe WordPress theme from Tesla Themes. The premium theme is designed for sharing your recipes and cooking tips with style and ease and is ideal for chefs, foodies, home master chefs and other food lovers. It includes a handy recipe filter, ingredients list and cook methods, plus a heap of other great features and options. 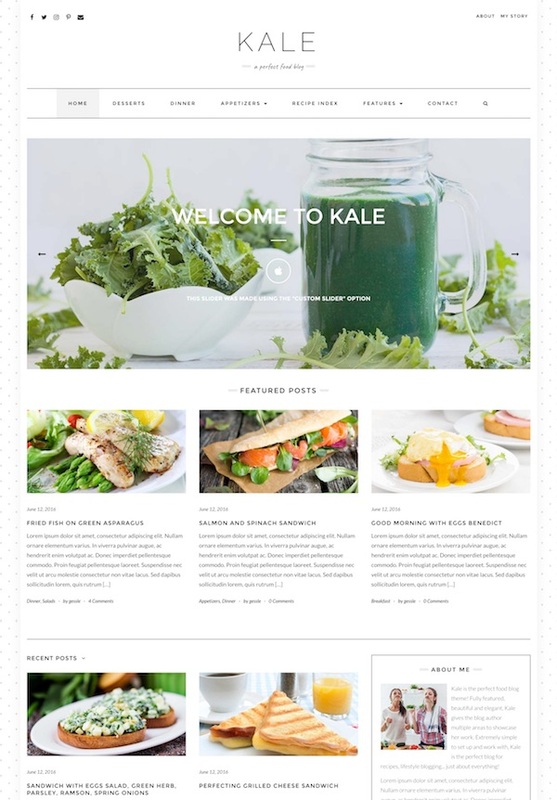 Kale Pro is a beautiful blogging WordPress theme specifically crafted to help you create a stunning recipe and food blog. It would also be ideal for fashion, lifestyle, parenting, or any other type of online publication. The premium theme from LyraThemes has an elegant minimalist design with good use of whitespace and emphasis on your photos. It also has some great areas to showcase some of your most important content. The theme is lightweight but loaded with handy features. Some of the key features and benefits of the Kale Pro theme include: built-in recipe short code for structured data Google friendly recipe cards, special category templates, recipe index template, built-in ads, front page banner or slider, features and highlighted posts on the homepage, three blog display options, custom colors and fonts, lots of sidebar widget options, responsive design and more. 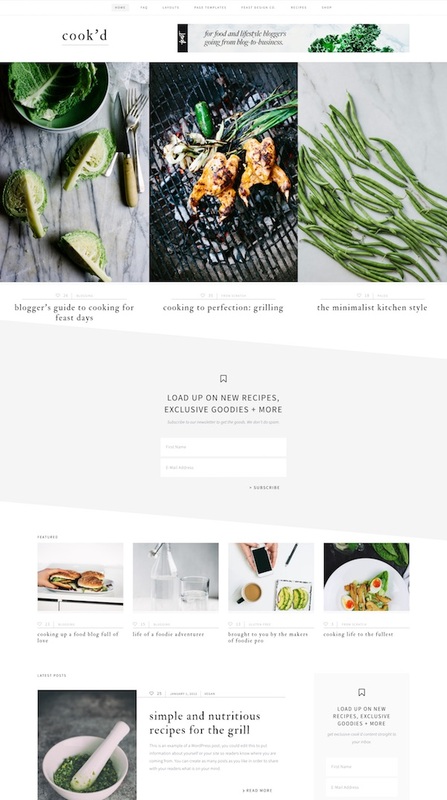 Meridian Recipes is a beautiful food and recipe WordPress theme designed for food bloggers. The responsive premium theme from Meridian Themes has a clean and minimalist white design so it’s easy to read and your food photos will really stand out. The theme allows you to display recipes as well as articles so you can built the perfect recipe website and a magazine to compliment it. The theme has 4 different homepage layouts but comes with 19 flexible modules so you can build your own homepage layout. It also has a heap of great food and recipe specific features such as: recipe ingredients and preparation steps, a distraction free cook mode (that only shows you the important stuff for when you want to cook and follow the recipe), ready for print recipe styleheets, sharing functionality, rating and bookmarks system, newsletter popup module and more. The Clean Food Theme is a beautiful food blog WordPress theme designed specifically for food bloggers, recipe sites and food bloggers. The premium theme from cre8d design has a clean and minimalist design that’s fully responsive and ideal for showing your food photos with large featured images. It has all the features you need to easily create a professional food blog that will keep visitors coming back. Some of the key features include: custom homepage layout with featured recipes, large photographs with lots of white space, flexible recipe index (use grid and or lists for categories, alphabetical list by ingredient etc), nice recipe layout that’s easy to read, print and pin, works with Easy Recipe Plus, featured and favourite recipe sections, social media and Pinterest pin buttons on images, plenty of ad options, shop template, “as seen in” media logos grid, FAQ, 2 different mobile menu options, customization options and much more. 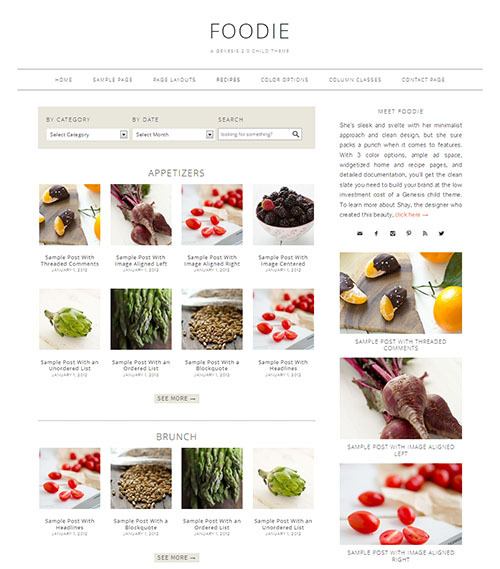 Foodica is a beautiful food and recipe WordPress theme designed specifically for foodies. The premium theme from WPZOOM has a very clean white design with great typography and large featured images to show-off your food creations. While Foodica was created for food related websites it’s such a nice looking and versatile theme you could use for any type of blog or online magazine website if you wish. Some of the key features of the theme include: a mobile friendly responsive design, 6 color scheme options, touch enable slider, carousel widget, featured categories, visual customizer (to easily customize the theme – colors, fonts, background, logo, menu, widgets and more), recipe shortcodes (for Ingredients and Directions), WooCommerce integration, 4 ad zones for banners or Adsense, 2 layout styles for posts (list or grid), Instagram scroller in the footer, JetPack support, newsletter integration with MailPoet Newsletters Free Plugin, easy translation for localization and more. Savory is a beautiful child theme for the Genesis Framework. The premium theme from Restored 316 Designs offers great flexibility and functionality in a fresh and unique design. 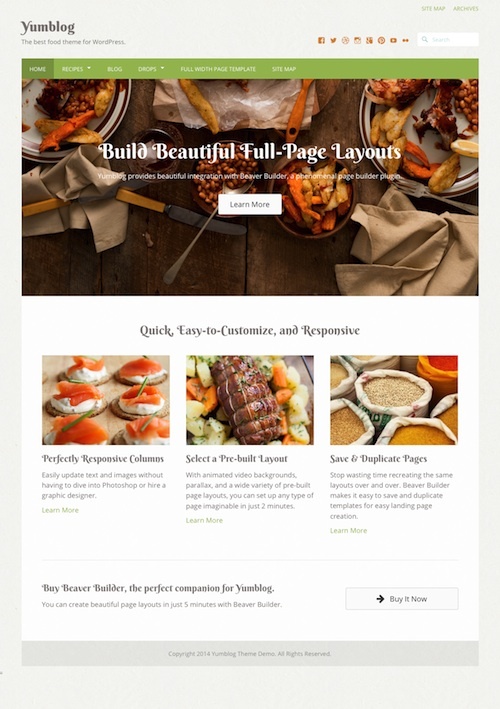 Savory is a theme ideal for food bloggers wanting a clean and modern design. Some of the other key features and benefits of the theme include: flexible homepage area (add as many or as few widget areas as you want), category index (for easy post navigation), custom categories, unique and customizable newsletter widget, WordPress Customizer (to easily change colors and styling), WooCommerce ready, footer widgets with ad spaces, custom backgrounds, HTML 5 markup, plugin styling (WooCommerce, JetPack, Genesis Responsive Slider, Easy Recipe, Instagram Feed, and more), and all the other great features and benefits of the Genesis Framework itself. Foodie is a beautiful mobile friendly responsive WordPress theme for foodies and food bloggers. The premium theme has a sleek and stylishly minimalist design that will really make your food photos and content stand out. 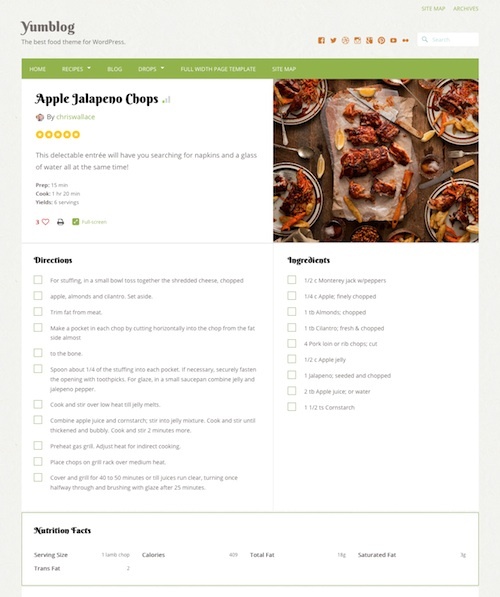 Some of the key features of the Foodie theme include: 3 colour options, widgetized home, recipe index and recipe pages, spaces for ads, styling for the easy recipe pro and gravity form plugins, and more. Foodie is a child theme for Genesis Framework so also inherits all the other great features and options of the Genesis 2.0 Framework. MH Magazine is a highly flexible WordPress magazine style theme with lots of great functionality for easily creating a modern and professional online magazine, blog, news site or other editorial project. The Food Magazine version of the theme shown below would be ideal for food magazine websites, foodie blogs, recipe and cooking websites, health and lifestyle sites and others. The premium theme is fully mobile responsive and SEO optimized and includes lots of great features such as: advanced layout options with full control over your layouts, easy to use theme options, custom widgets, color pickers with unlimited color options, Google fonts, content sliders and carousels, custom logo and menus, advertising areas, social ready and much more. 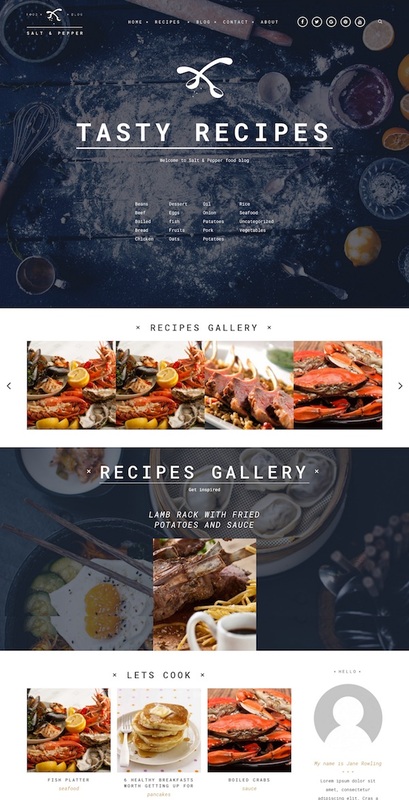 Yumblog 2.0 is a fantastic mobile friendly food WordPress theme for food bloggers, foodies, food enthusiasts, recipe bloggers and others wanting a powerful and fully featured CMS quality food website. The responsive premium theme from UpThemes has a beautiful clean and modern design and integrates with a few select plugins for advanced page layout building and food and recipe functionality. 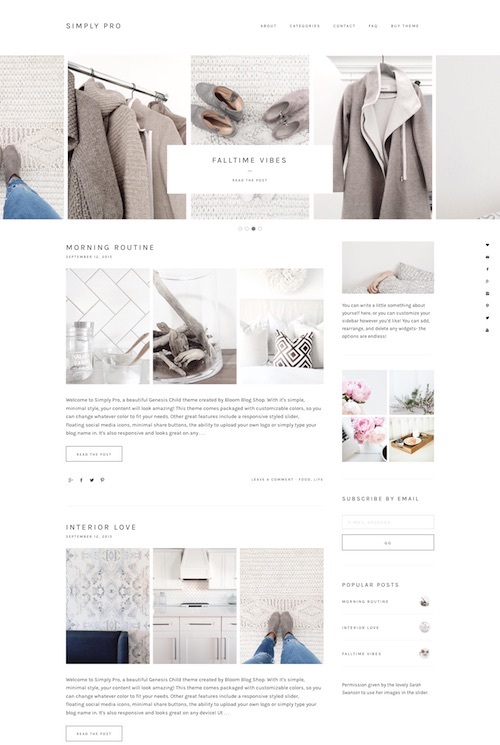 Devine is a stylish and minimalist multipurpose child theme for the Genesis Framework with WooCommerce support. The premium theme from Restored 316 Designs is versatile and customizable and can be used for any type of blog, website or even a web store. It has a hybrid blog magazine style homepage and would be perfect for a food blog, fashion and style blog, personal blog, mommy and parenting site or any other genre. Some of the key features of the theme include: a mobile responsive layout, 6 color schemes and options to create your own, 3 layout options, category index, footer widgets, upload custom backgrounds and logo, HTML5 markup, plugin styling (WooCommerce, Easy Recipe, JetPack, Genesis eNews Extended, Genesis Responsive Slider, Simple Instagram, Simple Social Icons), and all the other features and befits of the core Genesis Framework (required and sold separately). 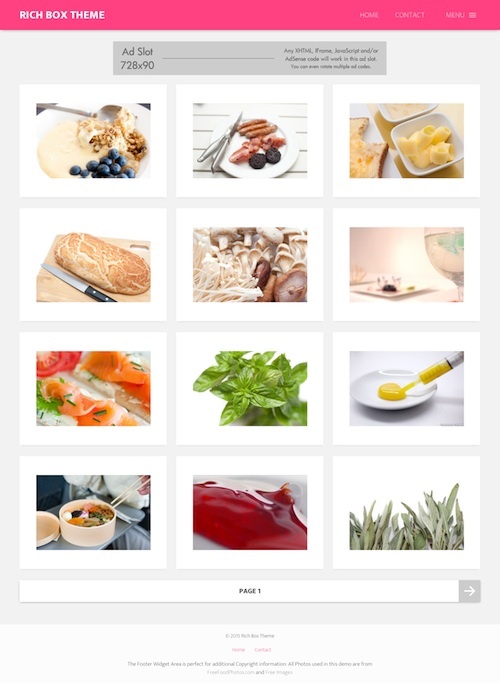 Tasteful is a beautiful child theme for the Genesis Framework perfect for food bloggers to show-off their food and recipes. The premium theme from Restored 316 Designs has a very clean, white and minimalist design that will make your food photos stand out. You could of course use the theme for any other type of website if you wish. 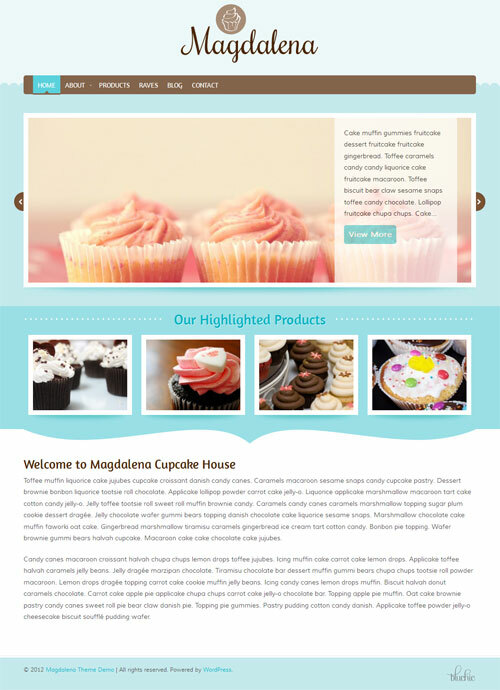 Some of the key features of the theme include: 6 colour schemes, 3 layout options, recipe cards styled with Easy Recipe plugin, split sidebars, custom archives and category index page templates, landing page template, widget areas for messages or ads, HTML5 markup, a mobile responsive design and more. A premium WordPress blog theme from Obox designed for food, cooking, clothes, craft and art websites. The theme includes a unique custom homepage layout, beautiful gallery template with pop-up images, advanced theme framework options, typography manager, custom page templates and more. Showing the ingredients and directions sections (shortcodes), recipe ratings, and Instagram photos widget. 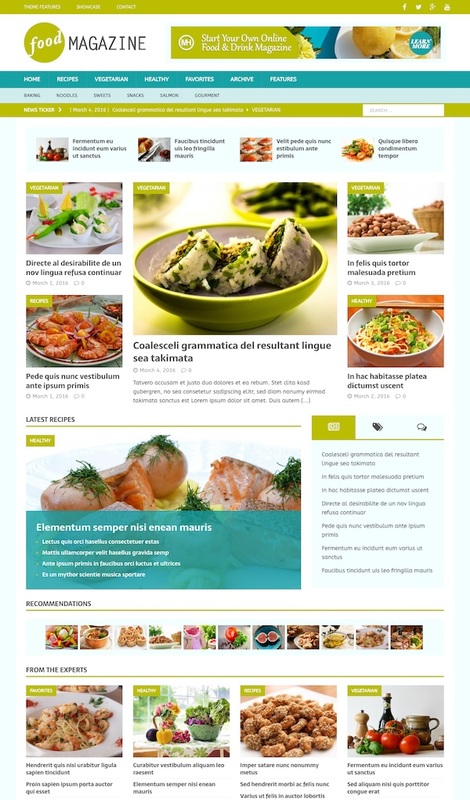 Petit is a WordPress theme for food and recipe websites, although it’s also versatile enough to be used for a variety of other blog and magazine style sites. 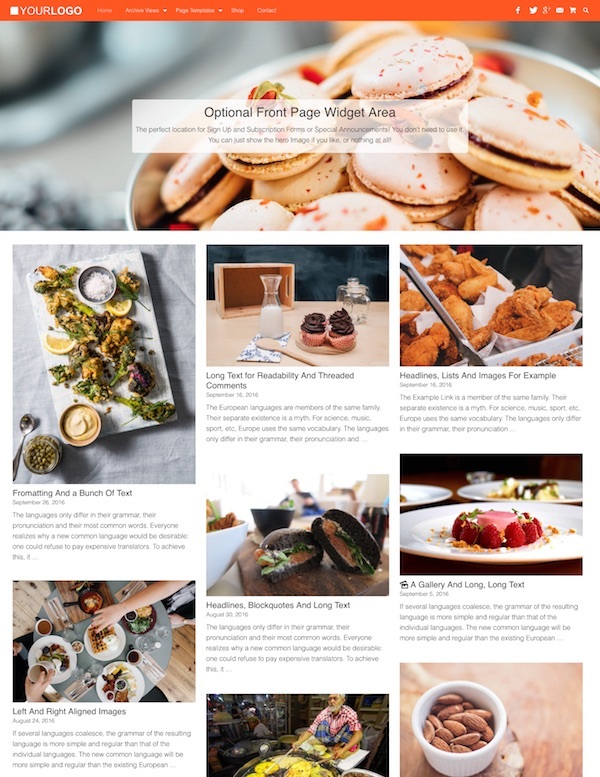 The premium theme from WPZOOM has a nice organic colour scheme ideal for food blogs and has a fully responsive design so the layout will automatically adapt to fit on any screen resolution on desktop and mobile devices (iPhone, iPad etc). The theme has a magazine style homepage design so it will stand out from all the other food bloggers with its big featured recipe slider as well as a vertical carousel slider under that. Besides numerous built-in shortcodes it has two custom shortcodes specifically for recipes: Ingredients and Directions. This allows you to quickly and easily create nicely styled sections for ingredients and directions in your recipe posts. Another interesting aspect of this theme is the fact it does not use custom post types for recipes like many other food WordPress themes, but rather uses just a standard post. This allows people with existing food and recipe websites to easily switch to this theme (or another theme later) and not have any hassle losing your content. However there is still an option that allows you to let the theme know which of your posts are recipes, and which are traditional blog posts. Simple Pro is a child theme for the Genesis Framework from StudioPress. The premium theme would be perfect for food blogs with its trendy, simple and minimalist design that will make your content and food photos look amazing. Some of the key features of the theme include: customization options via the Theme Customizer (to style the colors of your text, links buttons, footer etc), a mobile friendly responsive design, easy logo upload, responsive slider, floating social media icons and minimal share buttons, plus all the other awesome features and benefits of the rock solid, search engine optimized and secure Genesis Framework. Restaurant & Food WordPress Themes – a comprehensive gallery listing all the best WordPress themes for food and restaurant websites.